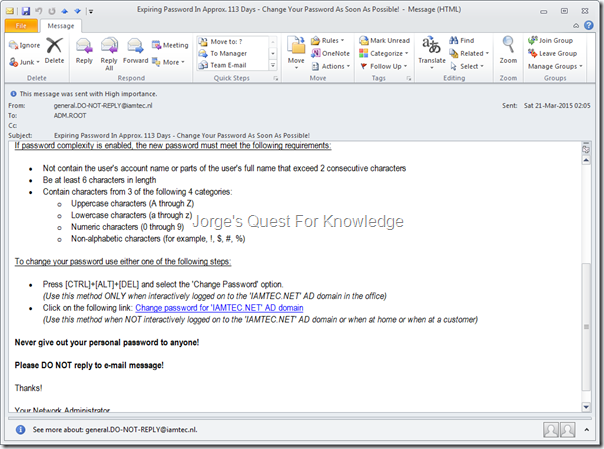 Tooling/Scripting « Jorge's Quest For Knowledge! 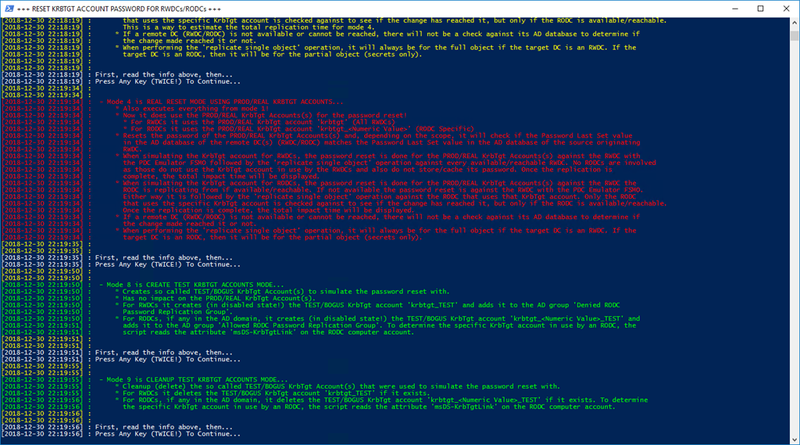 Every wanted to do the same in PowerShell? 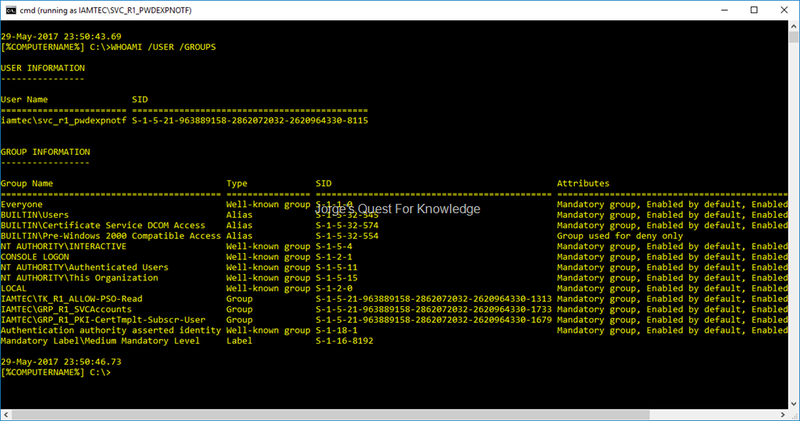 Although it gives you the required information, it still does not list the groups in a nice way. So let’s try that! In the blog post (2009-01-01) Domain Join through an RODC instead of an RWDC I explained the so called read-only domain join against an RODC. In that blog post you will find a VBS script that helps you achieve that goal. Prior to the VBS script you see multiple ways of pre-creating the computer and having the password of the computer account replicate to the RODC. 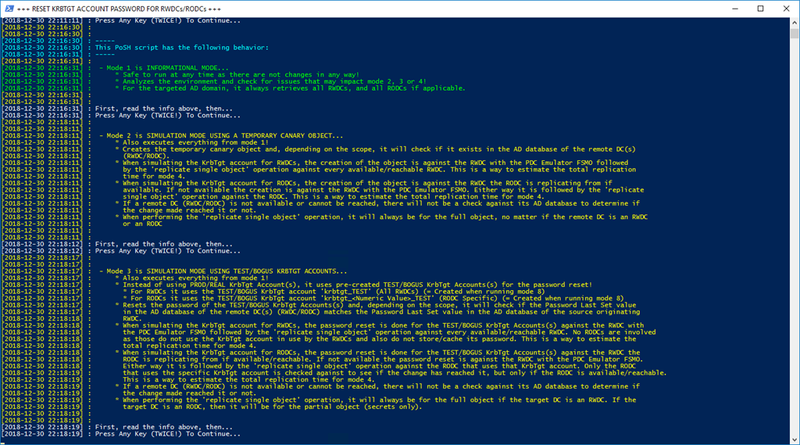 In this blog post I provide an updated PowerShell script (don’t forget the execution policy on the server!) that performs the read-only domain join. 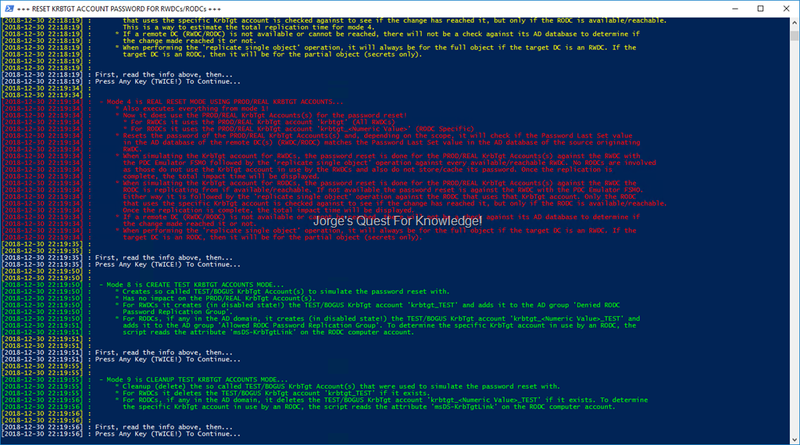 You can get the PowerShell script through this link, or you can copy it from below. ###                my test/demo environment. If you are using a different port number, then make sure to change that first before running the script. ###                If you use the dynamic range of RPC ports OR you do not have a firewall between your servers and RODCs, then remove that custom port number! 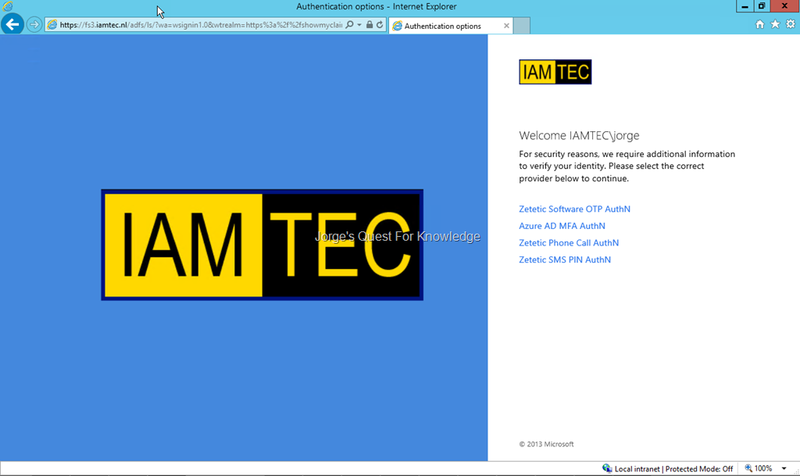 Joins a stand alone server to an AD domain through a targeted RODC. The FQDN of the AD domain, the server needs to be joined to. The FQDN of the RODC that will be targeted to join the server to the AD domain through a read-only join. The IP address of the local server. The password of the computer account that was set during the pre-creation of that computer account. This script requires local administrator permissions. $datetimeLogLine = "[" + $(Get-Date -format "yyyy-MM-dd HH:mm:ss") + "] : "
Out-File -filepath "$logFileFullPath" -append -inputObject "$datetimeLogLine$dataToLog"
Write-Error "Function 'Get-SubnetMask-ByLength'...: Invalid Subnet Mask Length Provided. Please Provide A Number BETWEEN 0 And 32"
$uiConfig.WindowTitle = "+++ READ-ONLY DOMAIN JOIN THROUGH AN RODC +++"
$userName = $adDomain + "\" + $localComputerName + "`$"
Logging "*     --> Read-Only Domain Join Through An RODC <--      *" "HEADER"
Logging "*      Written By: Jorge de Almeida Pinto [MVP-EMS]      *" "HEADER"
Logging "            BLOG: 'Jorge's Quest For Knowledge'          *" "HEADER"
Logging "       (https://jorgequestforknowledge.wordpress.com/)    *" "HEADER"
Logging "+++ PRE-REQUISITES CHECK +++" "HEADER"
Logging "ATTENTION: To Execute This Script, The Following Pre-Requisites Must Be met:" "WARNING"
Logging " * Local Server Is Configured Correctly With IP Address, Subnet Mask And DNS Servers..." "WARNING"
Logging " * Admin Account Must Be(Direct) Member Of Local 'Administrators' Group!..." "WARNING"
Logging " * If UAC Is Used, Admin Account Must Be Running Within An Elevated Administrator Command Prompt!..." "WARNING"
Logging " * Required Ports Must Be Opened Between This Server And Targeted RODC!..." "WARNING"
Logging "ATTENTION: This Script Will Fail Without The Pre-Requisites Mentioned Above!" "WARNING"
Logging "Press Any Key To Continue...(TWICE)"
Logging " * Your Admin Account IS NOT A (Direct) Member Of The Local 'Administrators' Group!..." "ERROR"
Logging " * Your Admin Account IS NOT Running Within An Elevated Administrator Command Prompt!..." "ERROR"
Logging " * Your Admin Account IS A (Direct) Member Of The Local 'Administrators' Group!..." "SUCCESS"
Logging " * Your Admin Account IS Running Within An Elevated Administrator Command Prompt!..." 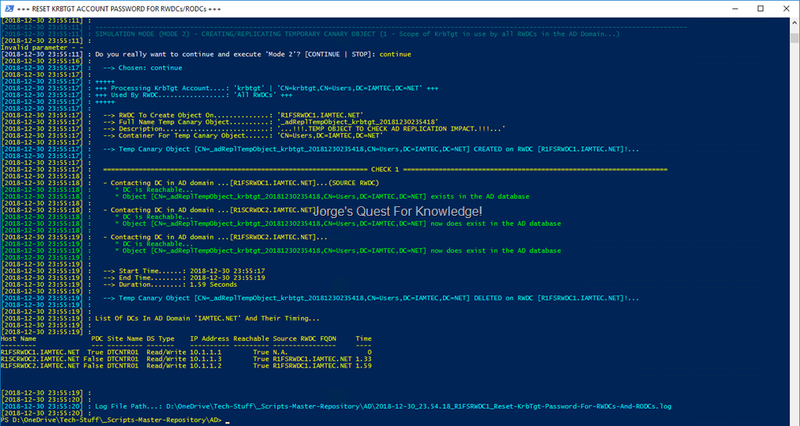 "SUCCESS"
Logging "The RODC '$rodcFQDN' IS Accessible And Listening On Port '$port'..." "SUCCESS"
Logging "The RODC '$rodcFQDN' IS NOT Accessible And Listening On Port '$port'..." "ERROR"
Logging " * One Or More Of The Required Ports IS/ARE NOT Available..." "ERROR"
Logging " * All The Required Ports ARE Available..." "SUCCESS"
Logging "Registry Value 'SiteName' In 'HKLM:\SYSTEM\CurrentControlSet\Services\Netlogon\Parameters' Exists..."
Logging "Registry Value 'SiteName' Has Been Deleted..."
Logging "Registry Value 'DynamicSiteName' In 'HKLM:\SYSTEM\CurrentControlSet\Services\Netlogon\Parameters' Exists..."
Logging "Registry Value 'DynamicSiteName' Has Been Deleted..."
Logging " * A Computer Account For This Server DOES Exist...And" "SUCCESS"
Logging " * A Correct Password Is Being Used..." "SUCCESS"
Logging " * A Computer Account For This Server DOES NOT Exist...Or" "ERROR"
Logging " * An Incorrect Password Is Being Used..." "ERROR"
Logging "+++ INITIATING READ-ONLY DOMAIN JOIN +++" "HEADER"
# Use Length, And Network ID Generation Is By Full Octet Format. $searcherSubnets.filter = "(&(objectClass=subnet)(objectCategory=subnet)(cn=" + $networkID + "/" + $i + "))"
#    $subnetsTableObj = "" | Select "AD Subnet","AD Site"
Logging "Trying To Join The Local Computer '$localComputerName' To The AD Domain '$adDomain' Using The RODC '$rodcFQDN'..."
Logging "FQDN AD Domain............: $adDomain"
Logging "AD Site RODC..............: $rodcADSite"
Logging "AD Site Local Computer....: $localComputerADSite"
Logging "Matching AD Subnet........: $localComputerADSubnet"
Logging "Local Computer Name.......: $localComputerName ($localComputerName`$)"
Logging "Computer Account Password. 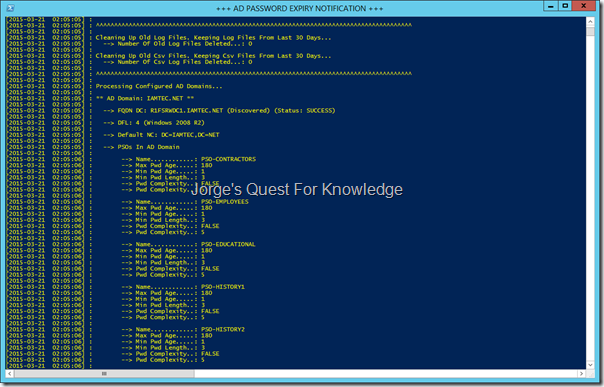 : $compAccountPWD"
Logging " * The AD Site Of The Local Computer DOES NOT Match The AD Site Of The Specified RODC..." "ERROR"
Logging " * Make Sure The IP Address Of The Local Server Is Configured Correctly So That It Will Match Against The Same AD Site As The Targeteed RODC..." "ERROR"
Logging " * The Cause Of The Mismatch Can Be:" "ERROR"
Logging "   * The Specified IP Address IS NOT Correct..." "ERROR"
Logging "   * The Specified RODC IS NOT Correct..." "ERROR"
Logging "   * The AD Subnet For The Local Computer Is Linked To The Incorrect AD Site..." "ERROR"
Logging "Domain Join Result Code...: $($returnErrorCode.ReturnValue)" "SUCCESS"
Logging "Domain Join Result Text...: $returnErrorDescription" "SUCCESS"
Logging "Domain Join Result Code...: $($returnErrorCode.ReturnValue)" "ERROR"
Logging "Domain Join Result Text...: $returnErrorDescription" "ERROR"
Logging " * The Computer Account Password Will Be Changed Shortly After The Domain Join!" "REMARK"
Logging "!!! THE COMPUTER WILL REBOOT AUTOMATICALLY IN 2 MINUTES !!!" "REMARK"
Logging "!!! TO STOP THE REBOOT USE THE COMMAND: SHUTDOWN /A !!!" 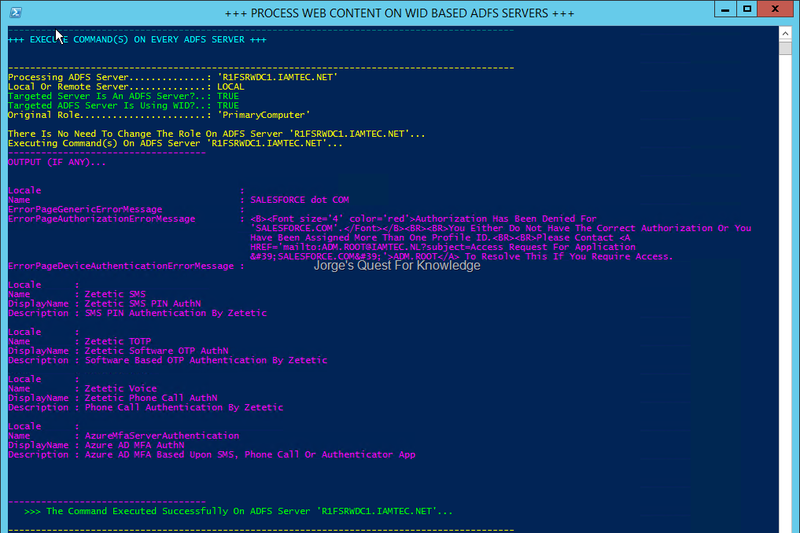 "REMARK"
Logging "+++ FINISHED +++" "HEADER"
This blog post only applies if you are using ADFS v3.0 (ADFS 2012 R2) AND you are using WID as the database store! 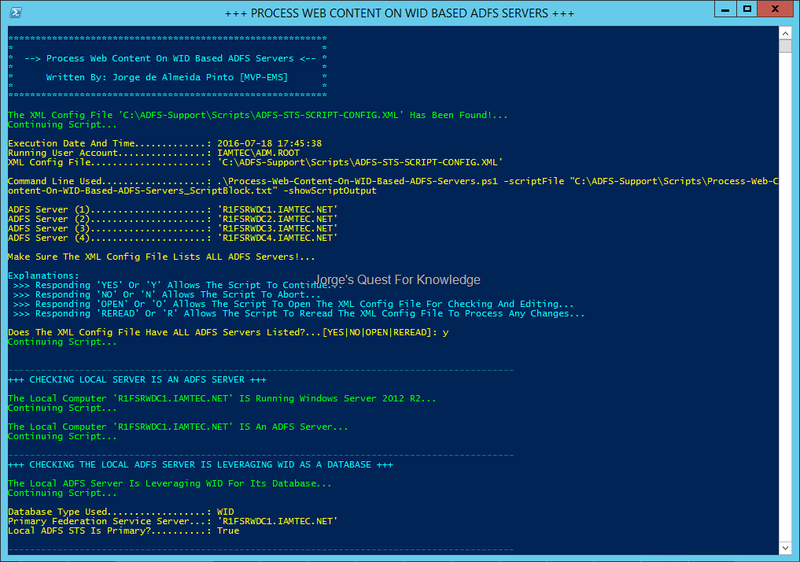 It does not apply when using SQL, and it does not apply when using ADFS v4.0 (ADFS 2016) with WID! 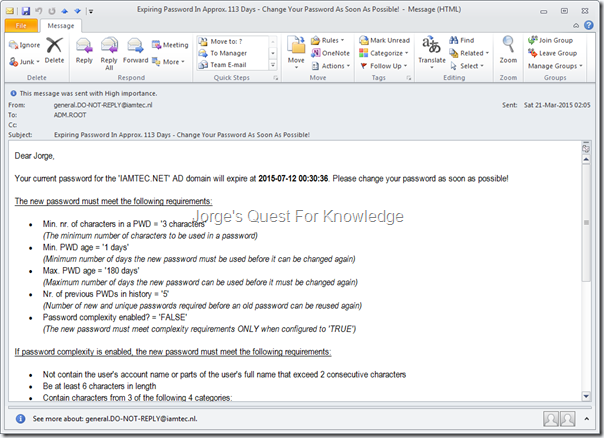 Set-AdfsRelyingPartyWebContent -Name ‘SALESFORCE dot COM’ -ErrorPageAuthorizationErrorMessage "<B><Font size=’4′ color=’red’>Authorization Has Been Denied For ‘SALESFORCE.COM’.</Font></B><BR><BR>You Either Do Not Have The Correct Authorization Or You Have Been Assigned More Than One Profile ID.<BR><BR>Please Contact <A HREF=’mailto:ADM.ROOT@IAMTEC.NL?subject=Access Request For Application 'SALESFORCE.COM'’>ADM.ROOT</A> To Resolve This If You Require Access." The user experience is as follows…. 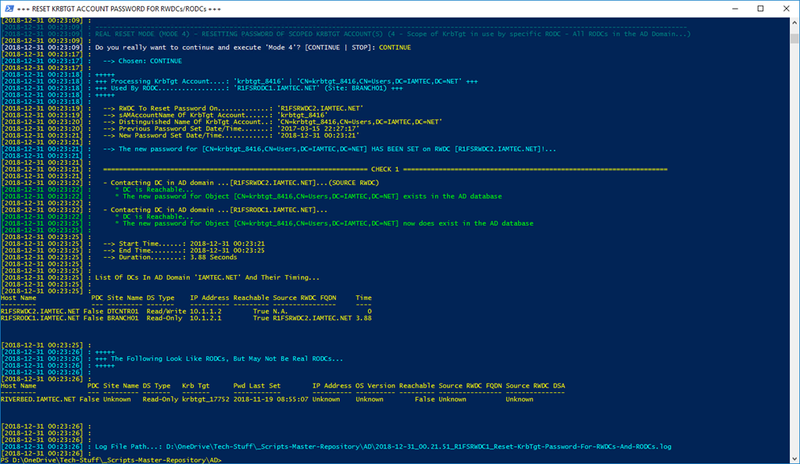 You might think to also execute the PowerShell commands on any secondary ADFS server. 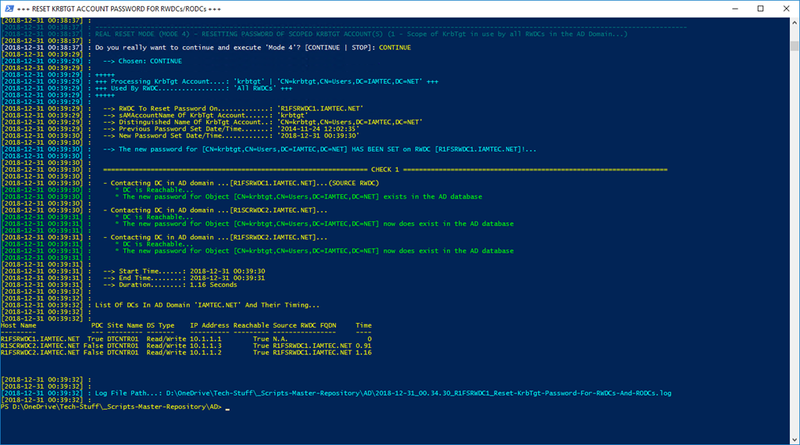 However, that’s not possible because secondary ADFS servers are not writable and therefore the PowerShell commands do not work. It will work however, if you temporarily configure a secondary to be a primary, execute the commands, then reconfigure it back to a secondary. 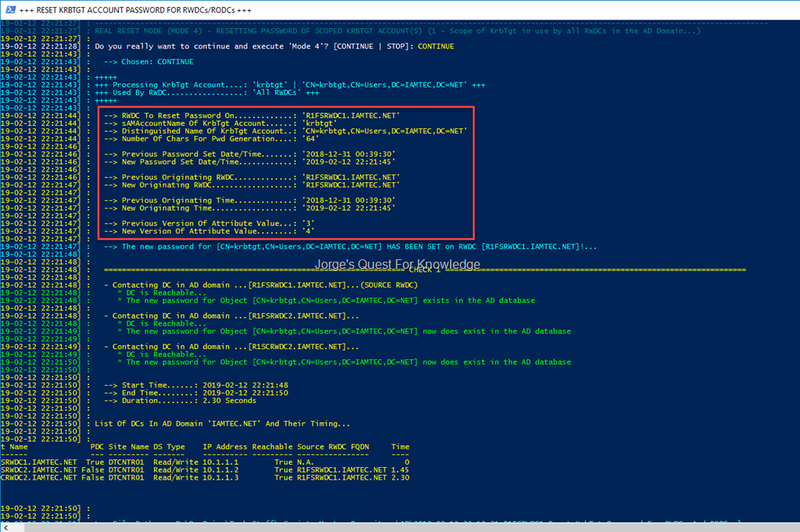 If you have multiple WID based ADFS servers, that can be some extensive work, which is also subject to mistakes ending up in inconsistencies. 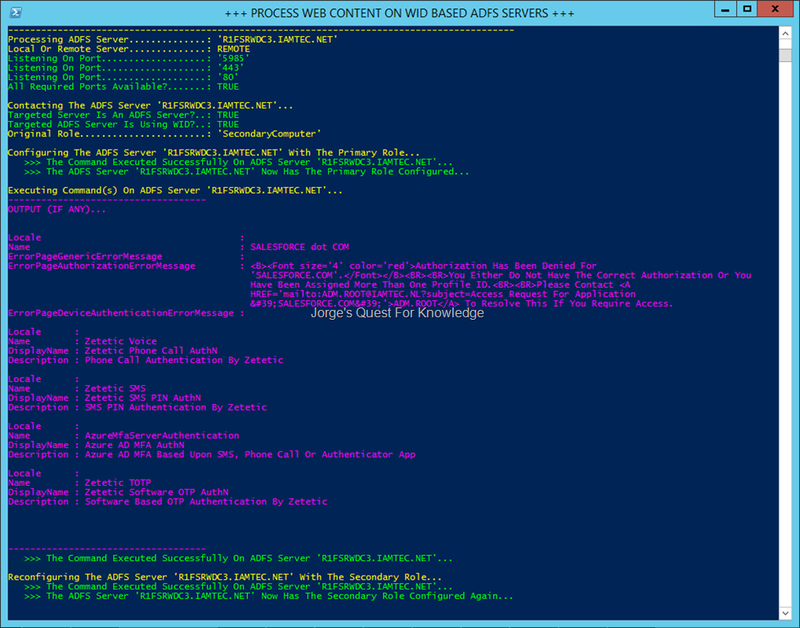 I wrote a script, which is available here that helps in configuring the web content on secondary ADFS servers. WARNING: I do not know if this is supported or not by Microsoft. However, it does solve the problem as currently unfortunately there is no hotfix that fixes this issue in ADFS v3.0. Make sure to test this FIRST in a test lab before using it in production! 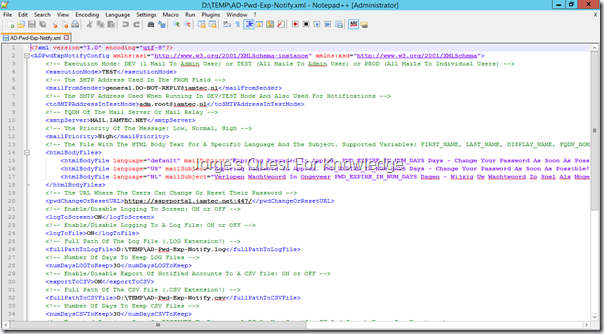 However, if you have a new configuration that must be applied to all ADFS servers, you may still use this parameter, but you can also create an XML file that contains all ADFS servers. This can be handy when you must apply changes to all existing ADFS servers. When you want to use the XML config file, do not use this parameter and the script will look for the XML config file which must be in the same folder as the script itself. By default the script will look for the XML file! 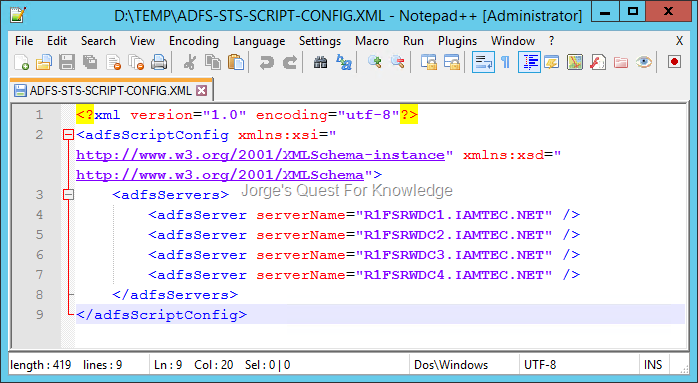 It will abort if it does not find the XML config file! With this parameter one PowerShell command can be specified as a value for this parameter. Pay very special attention to the quotes used! Example value: "Set-AdfsRelyingPartyWebContent -Name ‘SALESFORCE dot COM’ -ErrorPageAuthorizationErrorMessage `"<B><Font size=’4′ color=’red’>Authorization Has Been Denied For ‘SALESFORCE.COM’.</Font></B><BR><BR>You Either Do Not Have The Correct Authorization Or You Have Been Assigned More Than One Profile ID.<BR><BR>Please Contact <A HREF=’mailto:ADM.ROOT@IAMTEC.NL?subject=Access Request For Application 'SALESFORCE.COM'’>ADM.ROOT</A> To Resolve This If You Require Access.`""
With this parameter one or more PowerShell commands can be specified in a text file. The complete path of the text is then used as a value for this parameter. This parameter tells the script to display the output of the commands on screen, if there is anything to display at all. Another thing to be aware of is that the script logs everything into an event log called “Custom – Support”. If the event log does not exist it will create it and also register the source. If you do not want this, scan through the script and remove or out comment those parts! As you may have read in this blog post you need to export and import the configuration when moving from SQL-based ADFS to WID-based ADFS. The reason for not working? Around 2009 I wrote a blog post about and also wrote a tool to notify users through e-mail when their password was going to expire. You can read all the details about the idea here. 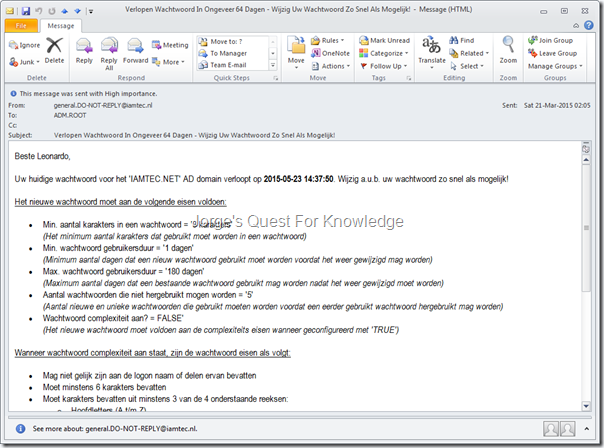 Now that tool was very inflexible and because of that I received numerous requests to make it more flexible such as the ability to customize the e-mail message. With this blog post I’m sharing a brand new tool, based upon PowerShell, that will notify users through e-mail when their password is going to expire. So let’s get started in explaining on this works! I did not test all combinations! However, I do expect it to run on any Windows version as long as PowerShell is available. It should also work against any AD version and there is NO dependency on using the AD PowerShell CMDlets!. Everything is done through ADSI to be independent of Windows versions! It will also support PSOs if the DFL is high enough and PSOs are configured! This script must be able to read the contents of the PSO container in every AD domain the script will target!. 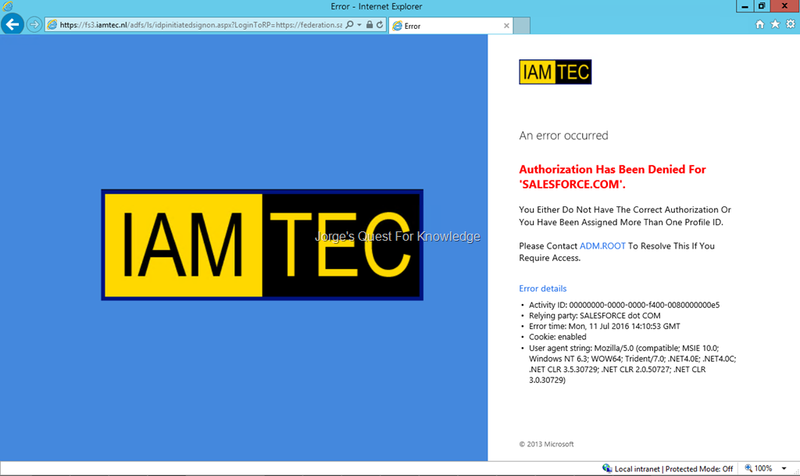 By default only Domain Admins can read this. It is therefore needed to delegate those permissions to the account executing this PoSH script. 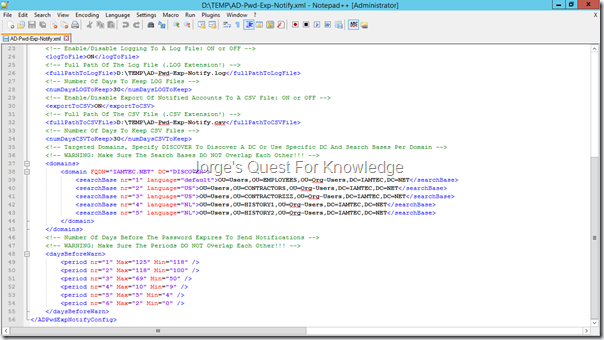 The tool uses an XML called "AD-Pwd-Exp-Notify.xml". It is pre-filled with examples from my test/demo environment. Make sure to change as needed to accommodate your own environment and requirements! The script has four execution modes. 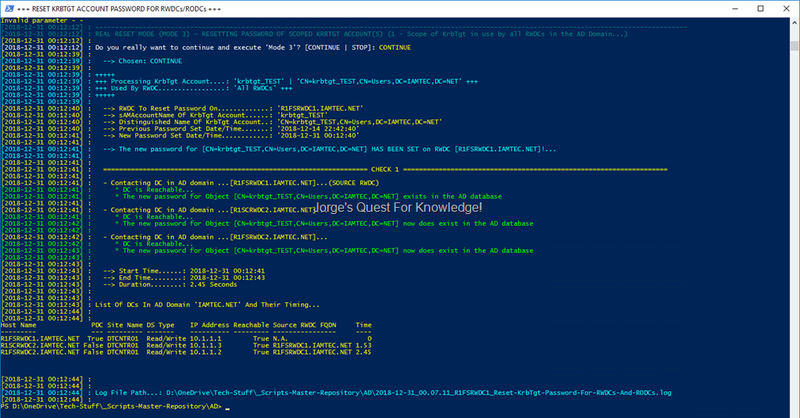 When NOT running the PowerShell script with the ‘-force’ parameter, it will by default run in TEST mode without sending any e-mail to users regarding password expiry ("TEST (NO MAILINGS)"), no matter what the configuration in the XML files specifies. 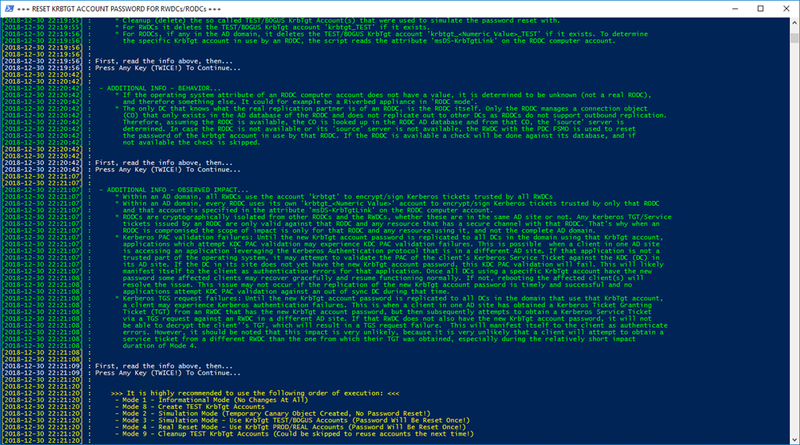 When running the PowerShell script with the ‘-force’ parameter, it will look in the XML file to see which execution mode to run in. 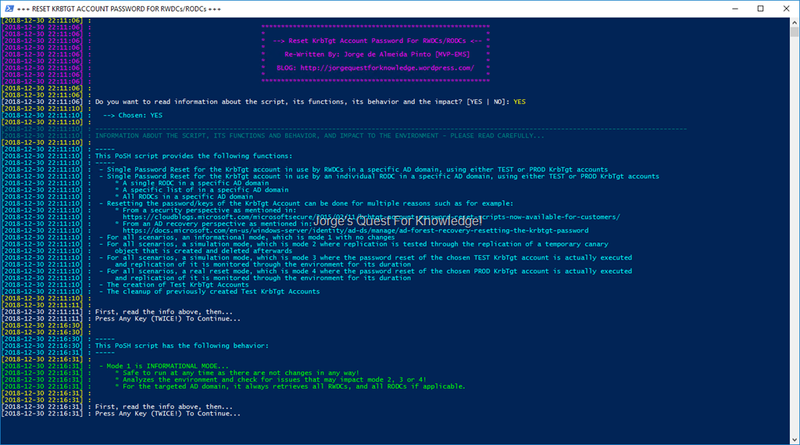 When "DEV" is specified it will only send 1 mail to the SMTP address of the admin user specified in the "toSMTPAddressInTestMode" configuration field. This mode allows you to develop the solution being swamped in e-mails or impacting your users. 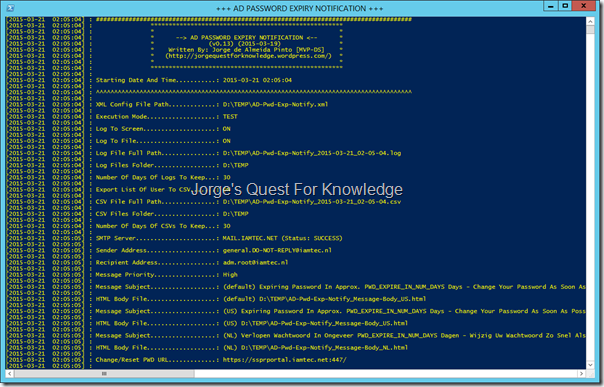 When "TEST" is specified it will only send all mails to the SMTP address of the admin user specified in the "toSMTPAddressInTestMode" configuration field. This mode allows you to see/experience what your scoped/targeted users would see/experience without actually impacting them. When "PROD" is specified it will only send all mails to the SMTP address of the individual users. This really sends the e-mails to all the scoped/targeted individual users. To develop the solution and test it you can specify an SMTP address that will be used to send e-mails to, without impacting the real user community. That SMTP address will also be used for notifications is the SMTP server or DC is unavailable. 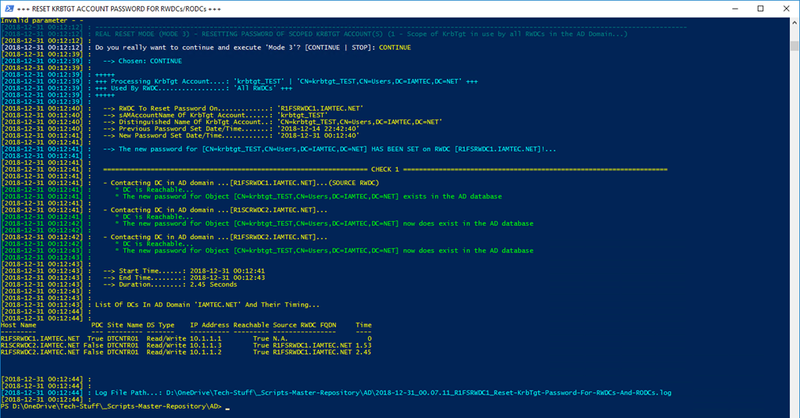 The PowerShell script sends e-mail, therefore it requires an SMTP server. A test connection to the SMTP server is made. If it fails the script aborts! The script supports multi-lingual messages. You must always specify a default language and for each language you must also specify a mail subject and the full path to HTML body file that contains the text in a specific language. Both the subject and the body support variables that can be replaced by the actual values. The script contains an example for US (English) and the same example for NL (Dutch). Logging to screen can be enabled (ON) or disabled (OFF). Logging tofile can be enabled (ON) or disabled (OFF). When enabled (ON), the script will export the information of users to a CSV file for troubleshooting and analyses. When disabled (OFF) nothing is exported. In this section you can specify one or multiple periods of notifications. Make sure that none of the periods overlaps any other period!. 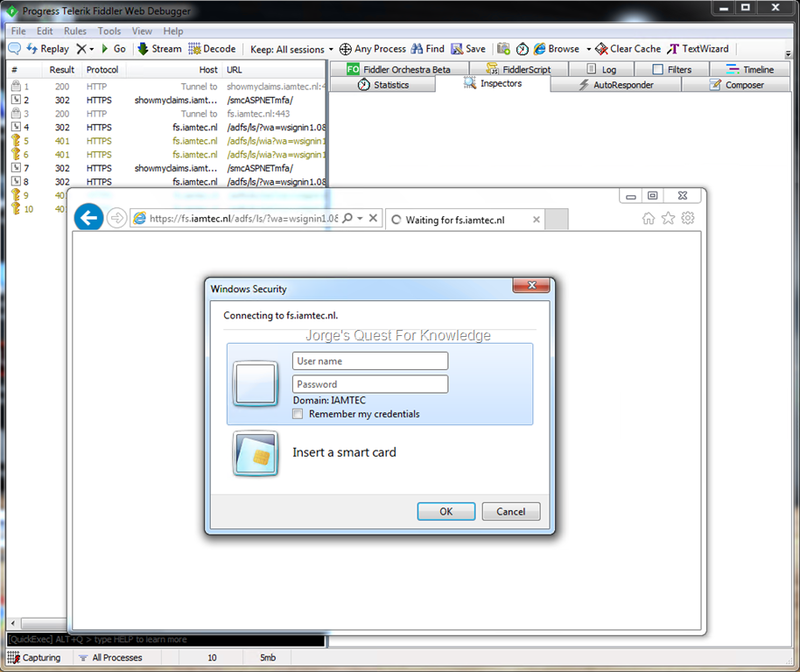 In the example shown, the scoped/targeted user will receive 4 notifications assuming the script executes once every day. Also make sure the periods configured are in balance with the maximum password age! environment. Make sure to change as needed to accommodate your own environment and requirements! * I wrote this script, therefore I own it. Anyone asking money for it, should NOT be doing that and is basically ripping you off! 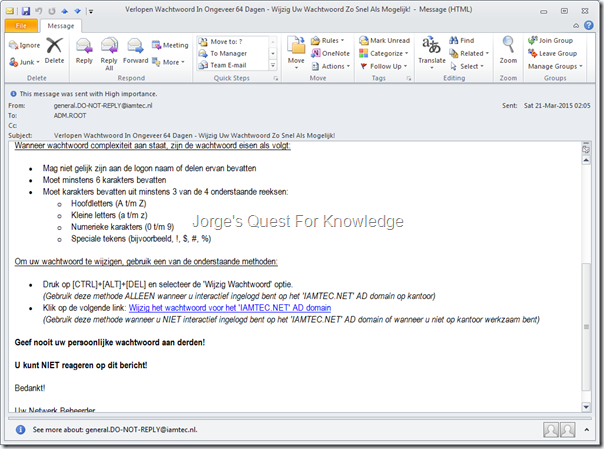 * The script is freeware, you are free to use it and distribute it, but always refer to this website (https://jorgequestforknowledge.wordpress.com/) as the location where you got it. * This script is furnished "AS IS". No warranty is expressed or implied! * Always test first in lab environment to see if it meets your needs! * Use this script at your own risk! * I do not warrant this script to be fit for any purpose, use or environment! * I have tried to check everything that needed to be checked, but I do not guarantee the script does not have bugs! * I do not guarantee the script will not damage or destroy your system(s), environment or whatever! * I do not accept liability in any way if you screw up, use the script wrong or in any other way where damage is caused to your environment/systems! * If you do not accept these terms do not use the script in any way and delete it immediately! * This script must be able to read the contents of the PSO container in every AD domain the script will target!. By default only Domain Admins can read this. * It is therefore needed to delegate those permissions to the account executing this PoSH script. $datetimeLogLine = "[" + $(Get-Date -format $formatDateTime) + "] : "
Out-File -filepath "$fullPathToLogFile" -append -inputObject "$datetimeLogLine$dataToLog"
$uiConfig.WindowTitle = "+++ AD PASSWORD EXPIRY NOTIFICATION +++"
[string]$scriptXMLConfigFilePath = Join-Path $currentScriptFolderPath "AD-Pwd-Exp-Notify.xml"
$fullPathToLogFile = $configADPwdExpNotify.ADPwdExpNotifyConfig.fullPathToLogFile -replace ".log","_$execStartDateTimeForFileSystem.log"
$fullPathToCSVFile = $configADPwdExpNotify.ADPwdExpNotifyConfig.fullPathToCSVFile -replace ".csv","_$execStartDateTimeForFileSystem.csv"
Logging "               * --> ACTIVE DIRECTORY PASSWORD EXPIRY NOTIFICATION <-- *"
Logging "               *                 ($scriptVersion) ($scriptDate)                  *"
Logging "               *      Written By: Jorge de Almeida Pinto [MVP-DS]      *"
Logging "               *          BLOG: 'Jorge's Quest For Knowledge'          *"
Logging "               *     (https://jorgequestforknowledge.wordpress.com/)    *"
Logging "Starting Date And Time...........: $execStartDateTime"
Logging "XML Config File Path.............: $scriptXMLConfigFilePath"
$executionMode = "TEST (NO MAILINGS)"
Logging "Log To Screen....................: $logToScreen"
Logging "Log To File......................: $logToFile"
Logging "Log File Full Path...............: $fullPathToLogFile"
Logging "Log Files Folder.................: $folderLogFile"
Logging "Number Of Days Of Logs To Keep...: $numDaysLOGToKeep"
Logging "Export List Of User To CSV.......: $exportToCSV"
Logging "CSV File Full Path...............: $fullPathToCSVFile"
Logging "CSV Files Folder.................: $folderCsvFile"
Logging "Number Of Days Of CSVs To Keep...: $numDaysCSVToKeep"
$smtpServerStatus = TestConnectionToServer $smtpServer "25"
Logging "SMTP Server......................: $smtpServer (Status: $smtpServerStatus)"
Logging "Recipient Address................: Individual Users"
Logging "Message Subject..................: ($language) $mailSubject"
Logging "HTML Body File...................: ($language) $fullPath"
Logging "Change/Reset PWD URL.............: $pwdChangeOrResetURL"
Logging "Cleaning Up Old Log Files. Keeping Log Files From Last $numDaysLOGToKeep Days..."
Logging "  --> Number Of Old Log Files Deleted...: $oldLogFilesToDeleteCount"
Logging "Cleaning Up Old Csv Files. Keeping Csv Files From Last $numDaysCSVToKeep Days..."
Logging "  --> Number Of Csv Log Files Deleted...: $oldCsvFilesToDeleteCount"
Logging "Processing Configured AD Domains..."
Logging "** AD Domain: $fqdnADdomain **"
Logging "  --> FQDN DC: $fqdnDC (Discovered) (Status: $dcStatus)"
$dcStatus = TestConnectionToServer $fqdnDC "389"
Logging "  --> FQDN DC: $fqdnDC (Static) (Status: $dcStatus)"
Logging "  --> SKIPPED DUE TO ERROR - UNABLE TO CONTACT DC!" 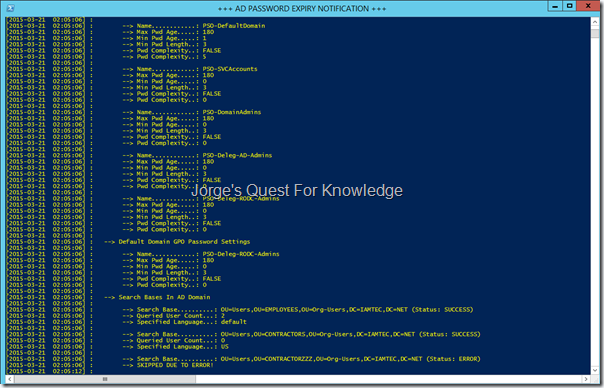 Logging "  --> SKIPPED DUE TO ERROR - DOMAIN DOES NOT EXIST OR CANNOT FIND DC!" Logging "  --> DFL: $dfl ($(DecodeFunctionalLevel $dfl))"
Logging "  --> Default NC: $defaultNC"
Logging "  --> PSOs In AD Domain"
$psoContainerDN = "CN=Password Settings Container,CN=System,$defaultNC"
Logging "       --> Name............: $psoName"
Logging "       --> Max Pwd Age.....: $psoMaxPwdAge"
Logging "       --> Min Pwd Age.....: $psoMinPwdAge"
Logging "       --> Min Pwd Length..: $psoMinPwdLength"
Logging "       --> Pwd Complexity..: TRUE"
Logging "       --> Pwd Complexity..: FALSE"
Logging "       --> Pwd Complexity..: $psoPwdHistoryLength"
Logging "  --> Default Domain GPO Password Settings"
$gpoName = "DefaultDomainGPO (" + $fqdnADdomain + ")"
Logging "       --> Name............: $gpoName"
Logging "       --> Max Pwd Age.....: $gpoMaxPwdAge"
Logging "       --> Min Pwd Age.....: $gpoMinPwdAge"
Logging "       --> Pwd Complexity..: $gpoPwdHistoryLength"
Logging "  --> Search Bases In AD Domain"
Logging "       --> Search Base..........: $searchBase (Status: $searchBaseStatus)"
Logging "       --> Queried User Count...: $userCountInSearchBase"
Logging "       --> Specified Language...: $languageForUser"
$listOfQueriedUsersObj = "" | Select "FQDN AD Domain",DN,"Given Name","Last Name","Display Name","E-Mail Address","PWD Last Set","PWD Expire Date","Days Until PWD Expiry","Account Expiry Date","Days Until Account Expiry","Effective PWD Policy","Language","Mail Subject","HTML Body File"
Logging "       --> SKIPPED DUE TO ERROR!" ### Creating An Empty Array For Users That Will Be Notified! ### Process Every Configured Warning Period. Make Sure In The XML NOT To Have Overlapping Periods! Logging "** Period: Max: $max Days | Min: $min Days **"
Logging "  --> User Count Within Warning Period...: $userCountInWarningPeriod"
### If If Was Configured To Export The List Of Users That Will Be Notified, Than Do So! 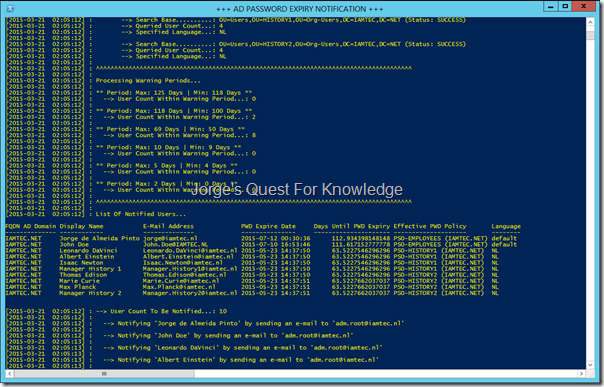 #Logging "List Of Queried Users..."
#Logging "--> User Count To Be Queried....: $userCountQueried"
Logging "List Of Notified Users..."
Logging "--> User Count To Be Notified...: $userCountNotified"
Logging "  --> No Notifications Have Been Send!" 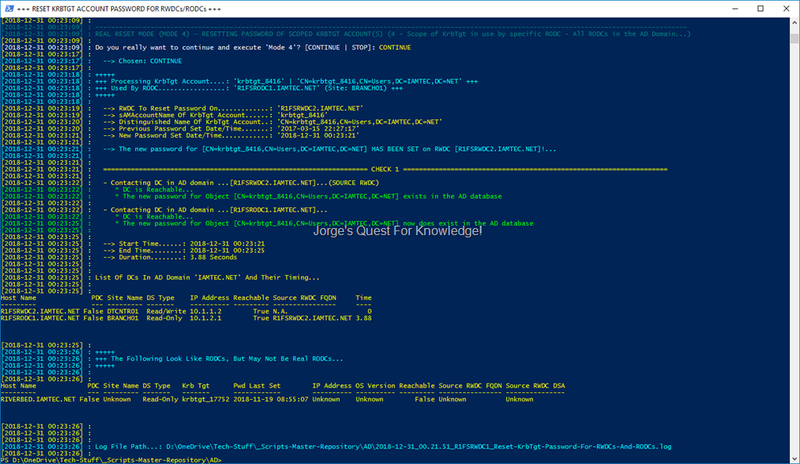 Logging "Displaying Information Of The Development User..."
Logging "PWD Last Set................: $adUserPwdLastSet"
Logging "PWD Expiry Date.............: $adUserPwdExpires"
Logging "Days Until PWD Expiry Date..: $timeDiffPwdExpiryInDays ($([math]::Round($timeDiffPwdExpiryInDays)))"
Logging "Effective PWD Policy Name...: $policyPWDName"
Logging "Effective PWD Min Length....: $policyPWDMinLength"
Logging "Effective PWD Min Age.......: $policyPWDMinAge"
Logging "Effective PWD Max Age.......: $policyPWDMaxAge"
Logging "Effective PWD History.......: $policyPWDHistory"
Logging "Effective PWD Complexity....: $policyPWDComplexity"
Logging "HTML Body File..............: $htmlBodyFileForUser"
Logging "  --> Notifying '$adUserDisplayName' by sending an e-mail to '$toSMTPAddressInTestMode'"
$effectivePWDPolicyNameOnUser = $_. "Effective PWD Policy"
$mailSubject = $mailSubjectForUser -replace "FIRST_NAME",$_. "Given Name"
$mailSubject = $mailSubject -replace "LAST_NAME",$_. "Last Name"
$mailSubject = $mailSubject -replace "DISPLAY_NAME",$_. "Display Name"
$mailSubject = $mailSubject -replace "FQDN_DOMAIN",$_. "FQDN AD Domain"
$mailSubject = $mailSubject -replace "PWD_EXPIRY_DATE",$_. "PWD Expire Date"
$mailBody = $mailBodyForUser -replace "FIRST_NAME",$_. "Given Name"
$mailBody = $mailBody -replace "LAST_NAME",$_. "Last Name"
$mailBody = $mailBody -replace "DISPLAY_NAME",$_. "Display Name"
$mailBody = $mailBody -replace "FQDN_DOMAIN",$_. "FQDN AD Domain"
$mailBody = $mailBody -replace "PWD_EXPIRY_DATE",$_. 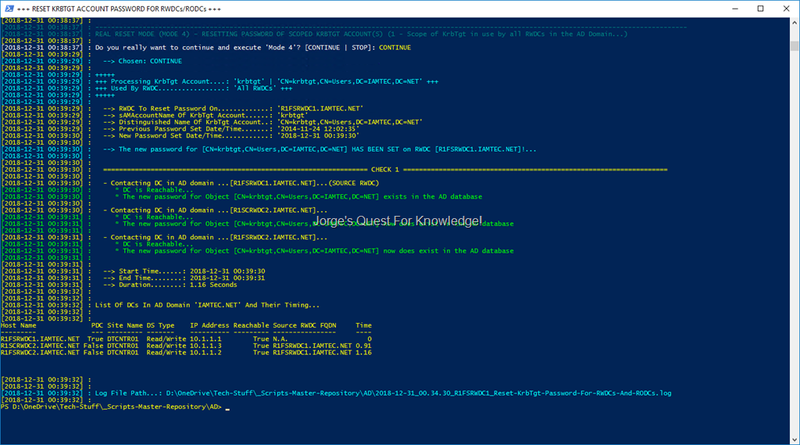 "PWD Expire Date"
Logging "  --> Notifying '$displayNameUser' by sending an e-mail to '$mailToRecipient'"
You can download the most recent PowerShell version from HERE.